On Wednesday of this week the Gunpowder flow climbed to 400 Cfs, and it was prime time to swing some big streamers. Wading was limited at these flows to a few steps off the bank, as the current was quite swift, but many accesses were fishable from shore. In many cases the trout were pushed against the banks and extremely active on flies at the end of the swing. In a few hours ten fish landed was a small number compared to the number of fish chasing, short striking or the ones that shook the hook. I did land a heavy trout (pic above), just under 15 inches, that fought hard and felt huge in the heavy current. A trico mayfly spinnerfall was ongoing from 11 am to 1 pm, and trout were rising in the soft water along the shore. 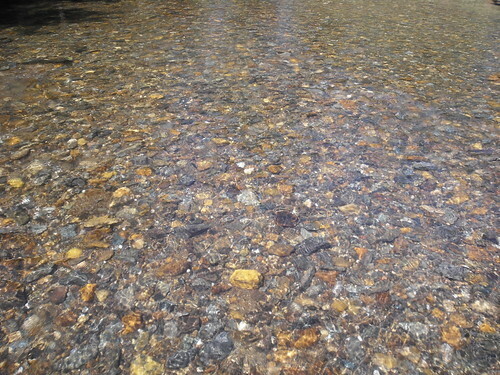 In addition to spill over increasing water levels, the water temperature increased a few degrees yet the water was still clear. On Thursday I fished at two different accesses, as the river dropped steadily through the day from the mid 300s to the upper 200s. Streamers continued to produce a lot of strikes and chases, but brought fifteen browns between 8-13 inches to the net. The patterns I was using worked on average size browns, but also piqued the interest of trout much, much larger than anglers would expect from the Gunpowder. The cloudy weather brought out BWOs and only seemed to intensify the trico hatch, as I filmed quite a cloud in the middle of a mating dance. While most of the river was still fast and pretty rough in the narrow areas, a number of long flats and backeddies had risers steadily working the surface. On Friday flows dropped down below 200 and while browns were still focused on streamers, a lot more fish were rising to the hatches of small mayflies. Saturday flows dropped to 150 Cfs, although more rain is forecasted so flows may climb again. If flows spike above 200 Cfs on the Gunpowder consider fishing, as the latest video features shots of high flows, clouds of tricos and some hungry wild brown trout. This entry was posted in fishing report, video on October 31, 2009 by Jason du Pont. Backwater Angler has fly fishing gift certificates for any occasion. As the Holidays approach check out the largest inventory of Simms products in Maryland. If you tolerated leaky waders all Summer now is the time to upgrade to a Simms Headwaters or Simms G3 Wader. The shop also stocks Gore- tex rain jackets from Simms such as the G3 Guide model and Rivershed. New arrivals this week include Vibram G4 Guide Boots, Vibram Guide Boots, Vibram Rivershed Boots and Vibram Headwaters Boots. We also have the Ladies Headwaters Waders and Women’s Vibram Headwaters shoes in stock. If you need time to stop in the shop to try this great gear on, get ahead of the rush and point your gift givers to the Backwater Angler Gift Certificates Page. Thanks to Willy for the kind words. Nice fly selection for my birthday! Janet knows to send friends to BA and ask for Theaux to fill the gift needs for all my gift receiving holidays. Just signed on to go to Patagonia for 2 weeks in January so I’ll visit soon to start working on tackle and flies. This entry was posted in gear, news on October 31, 2009 by Theaux Le Gardeur. The Gunpowder River is flowing at 244 CFS and is dropping. The river has been high for the past week due to spillover, and remember folks, spillover is good! 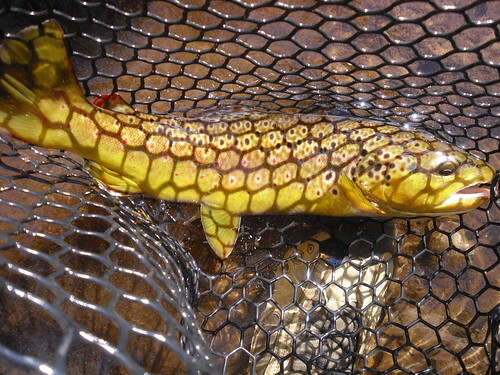 An equal number of reports point to streamers and small dries accounting for many wild fish released this week. As the water drops, try streamers along the edges and log jams. Small dries imitating Caddis and Bwo’s in the #18-20 range are working fine in the flats and riffles from Masemore Rd upstream. Jason just called in to report more than a few Tricos out along the river. Looks like Jason’s feeling better; great shots from his trip. The Gunpowder fished great on Sunday. I fished up above Falls Road and as the water dropped things got better and better. Late in the day caddis and lots of little brown stoneflies started coming off. I hiked in with the other fellow (Brad) who was at the shop when I was in there and we ended up fishing tan elk hair caddis and having fun watching the over eager browns chasing them across the surface. I’ve attached a shot of a healthy little guy who managed to actually catch my fly. Even with the kayak the fish were eagerly watching the surface. Looks like we may be setting up for a repeat with the high water again! I’m trying to get out this weekend again and will be tying furiously in the evenings this week. This entry was posted in fishing report on October 29, 2009 by Theaux Le Gardeur. Backwater Angler is a Maryland Sports License Agent and sells MD hunting and fishing licenses. The shop requires a valid ID, a hunter safety card and check or cash for license payments. The shop is located in Northern Baltimore County at 16928 York Rd Monkton, MD 21111 and is open from 10AM till 6PM weekdays and 8AM till 4PM weekends. 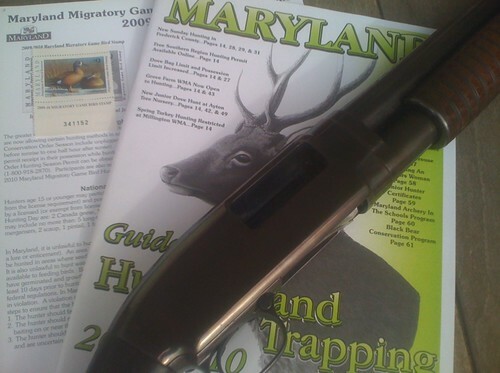 Pictured above are the 2009-2010 Maryland Hunting Regulations Booklets , one of this season’s Migratory Waterfowl stamps by Wally Makuchal Jr. and a Model 12, 16 gauge, chambered for 2 1/2 inch shells. Have a safe hunting season! The shop phone # is 410-357-9557. This entry was posted in news on October 29, 2009 by Theaux Le Gardeur. I arrived on Sunday October 18th in the afternoon at the Savage River after a three hour drive across Maryland through some incredible Fall scenery. The air temps were in the high thirties in the mountains and continued to climb into the fifties each day through the week. I decided to focus on nymphing the deeper runs and chutes found throughout miles of the Savage, as levels were perfect at 100 Cfs with water temps in the high fifties. In a few hours that first afternoon I caught a few ten to twelve inch browns, and cycled through a number of different patterns. On Monday morning I hiked into a favorite stretch and started working a deep, almost bottomless pool. After three drifts, I made a weight adjustment and on the fourth drift the indicator shot under and I set the hook on what initially felt like a rock. The rod doubled over and the fish just bulldogged me to the bottom in a back and forth battle; over and over again. I never got a clear look until I turned the fish at the net, but by the strength of the runs I knew it was a big fish. I measured the brown (pictured below) out at 18 inches, thick bodied and a head as big as my size ten Patagonia River Walker boot. Finally recovered from my injury (foot also pictured below) I felt a bit of redemption landing this particular fish after missing out on a month of guiding/fishing and canceled trips to Colorado and Western Maryland. Using my Scott S4 10 foot 4 weight I dredged the bottom of the deepest holes with long 12-14 foot leaders, thingamabobber and using a lot of weight to get the flies deep. I fished a number of nymph patterns, and the fish were willing to take a variety of different flies, if the drift was good. Cleaning leaves and algae off the hook were frequent chores, but deep nymphing as usual on the Savage. I covered a lot of water by Monday afternoon and landed over a dozen browns, with the majority over twelve inches. In addition to the brown above, and a number of nine to thirteen inch browns, I measured out one fourteen, one fifteen, one sixteen, and one sixteen and a half inch brown by day’s end. I had three more days of fishing left, and doubted any of the coming days would top this day. On Tuesday I moved a few miles into a different stretch of river with the arrival of warm and sunny weather. The hatches really started mid morning and I saw caddis, midges, and counted four different mayfly species. I saw a few risers at the end of a midday spinnerfall, but stuck with the deep nymphing rig. 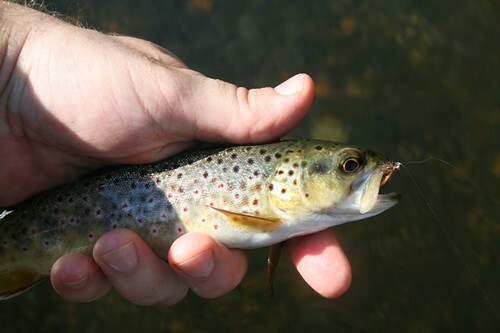 At the end of the day Tuesday I caught a few seven to ten inch brook trout and ten browns ranging from eight to thirteen inches, with three more browns over fourteen inches. Between the Fall foliage, warm weather and great fishing on miles of water with almost no anglers, it really couldn’t get much better. On Wednesday the Savage flows increased to 250 Cfs in an attempt to meet elevation goals for draining the reservoir for dam repairs this Winter. It seemed as good a time as any to drive over to the North Branch and wet a line, as the Savage fish adjusted to the rising water. I fished the Barnum access and came across a number of other anglers who relayed decent catches on bead head nymphs, san juan worms, wet flies and egg patterns. I cycled through a number of different patterns but had success on caddis pupas, scud patterns and pink San Juans. The majority of trout landed were rainbows 12-19 inches, and a few smaller browns. After speaking to ten or twelve anglers on the same stretch, few big browns were seen or landed, so I planned to fish the Savage the next day. Thursday was spent finding pools and pocket water where a decent drift in softer water with nymphs was possible with the rougher 250 Cfs flow. I decided in the last hour of daylight to break out my streamer rig, a Sage Z-Axis 10 foot 5 weight paired with a sinking tip line and a five inch articulated streamer on 3x tippet. I had a number of chases and swipes, and only one solid hook up, which pulled free. I ended the day content with eight fish all over ten inches with one heavy fourteen inch brown to show for a lot of rough wading situations, lost flies and lost fish in the higher flows. Friday was spent working in the rain, guiding a client who had never fished the North Branch. We jumped in where we could amongst the crowds above Barnum and fished up to the island, having a good time landing bows from 13-19 inches, and hooking a few other trout that shook the fly. On Saturday I slept in late and headed for home mid morning after a great week of weather, camping and catching some beautifully colored, hard fighting wild browns. The latest video features a quick shot of a BWO, caddis and parallep spinner I saw hatching early in the week on the Savage. It also includes footage of wild browns in a variety of sizes all caught in the Savage River. This entry was posted in fishing report, video on October 27, 2009 by Jason du Pont. The Gunpowder river is now dropping from a high of 330 Cfs last night to more fishable 276 CFs.The river is clear, 54 F in the catch and release area and will continue to drop through the next few days. Before the heavy rain started yesterday, lots of fish were rising to #18-20 Blue Winged Olives in the flats. Anglers returning From Falls Rd this morning reported that the Olives were just starting as they left the river. Cloudy cool, days are not to be missed if one is ready for some excellent dry fly fishing along the Gunpowder. Caddis and Caddis emergers, in the #16-18 range, are still accounting for a number of healthy loooking fish in the riffles. 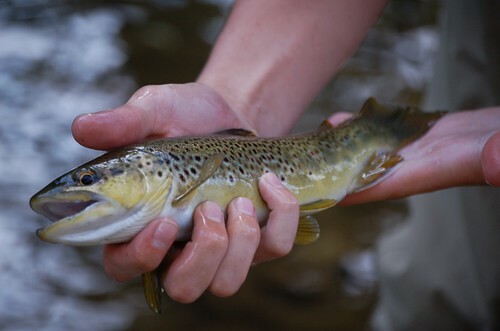 Try the catch and release stretch today because it stays clear even after a heavy rain event. The 2 fish a day and 5 fish a day water will be clearing by late this afternoon but will be a little on the high side to wade. It’s been tough to nymph through the leaves, so streamer fishing has been the ticket. Try larger muddlers, sculpins and clousers and move down to 4x tippet just in case…The yard work can wait and it’s a bye week for the Ravens so, unless you’re working on defense, grab a fly rod and wet a line just North of Baltimore along the Gunpowder river. This entry was posted in fishing report on October 25, 2009 by Theaux Le Gardeur. The long awaited Scott Custom Shop is now live. We put in some time today getting the links right and running with some help from none other than Scott Fly Rod President Jim Bartschi. Thanks Jim! This entry was posted in gear, news on October 22, 2009 by Theaux Le Gardeur. Thanks to Josh Reider for the stream report and pictures. Looks like double trouble strikes again. Congrats! Just got back from fishing on a tributary of the Gunpowder and caught a ton of fish. 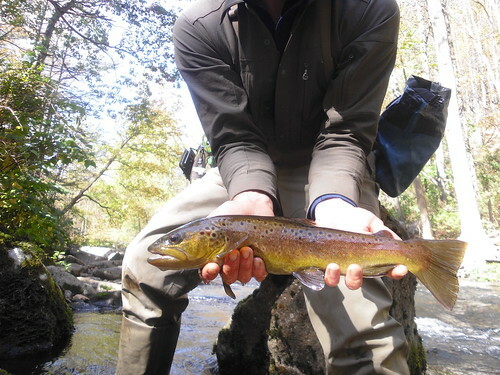 One of which was a mean looking brown trout. I fished a pheasant tail with a soft hackle as the dropper. Caught two fish at once! Thought I had a monster but was actually a small brookie and a fall fish. Just thought you would want to know, thanks for your recommendation. This entry was posted in fishing report on October 22, 2009 by Theaux Le Gardeur. The Fall stocking has been underway since the beginning of October! 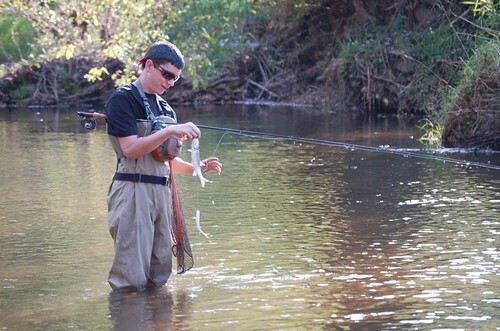 Now that the Put and Take area of the Gunpowder river, (from the Gas line between Corbett Rd and Upper Glencoe through Phoenix Rd) has some new residents it’s time to enjoy some beautiful weather and remarkably easy fly fishing and catching in Northern Baltimore County. The river at the Glencoe USGS gauge has dropped from a high flow earlier in the week of 1,220 Cfs/4.82 FT to an ideal 232 Cfs or 1.63 FT. Get out and give these bright hatchery fish some exercise! Bright streamers and heavy nymphs will do the trick. Thanks to Don Cosden, Assistant Fisheries Director, for the encouraging words that Fall fishing in Maryland is heating up from the MD DNR Fisheries web page. 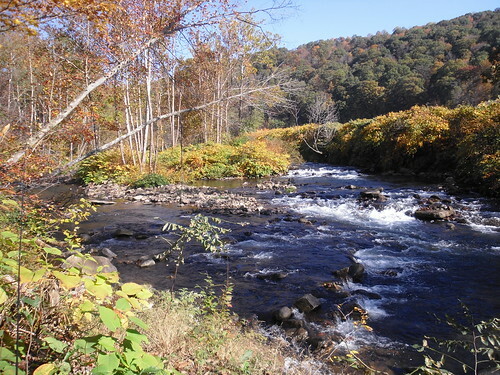 Streams are looking good and we will be stocking some nice fish so get out and enjoy the great fall weather. This is a great time to take a young person fishing. The creeks are easy to wade, the water is clear enough to see the fish and our hatchery trout are usually more than willing to cooperate. You’ll also find information about preventing the spread of invasives like whirling disease and didymo, an 800 number for updated stocking information and details on the Catch a Poacher program on the MD DNR Fisheries web page. This entry was posted in fishing report on October 21, 2009 by Theaux Le Gardeur. 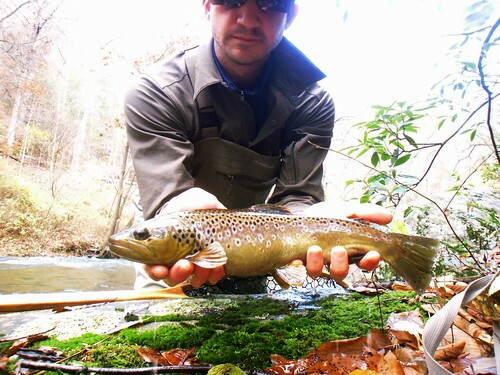 The Gunpowder River is Prime for Streamer Fishing.. This entry was posted in fishing report on October 19, 2009 by Theaux Le Gardeur.